North Korea is the only country to have tested nuclear weapons since 1998, when India and Pakistan both held their final underground tests, and all of North Korea's six nuclear tests have been carried out underground at the Punggye-ri Nuclear Test Site beneath Mantap Mountain (which is adjacent to the Hwasong Concentration Camp). The firing of the Hwasong-15 Intercontinental Ballistic Missile (ICBM) on Nov. 28, 2017. 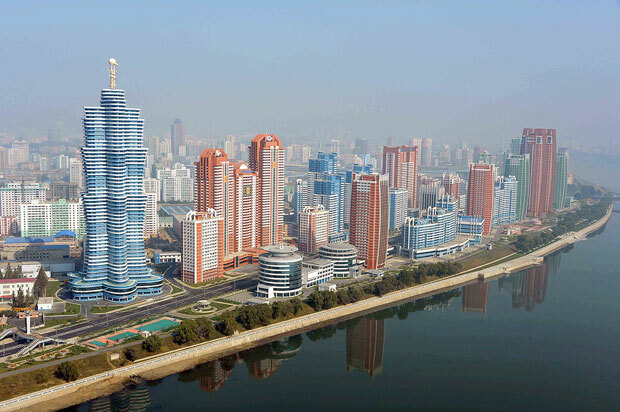 Image from Rodong Sinmun. Under Kim Jong Un, North Korea's nuclear and ballistic missile programs have become incredibly advanced and the speed of their accomplishments have often taken analysts by surprise. The development of these systems has occurred under the "two-track" or byungjin philosophy which seeks to develop the country's nuclear program and domestic economy in parallel. While their economy creeks along, it is becoming apparent that their nuclear and ballistic missile programs have been able to become largely self-sufficient and are produced with indigenous materials and technology. The September 2017 nuclear test was their largest test by far with a yield estimated to have been between 100 and 250 kilotons, which places it several times larger than the atomic bombs dropped on Japan during World War II. Furthermore, it is possible that the tested device was a hydrogen bomb and that the warhead could have a variable yield, allowing North Korea to "dial" up or down the warhead's power. 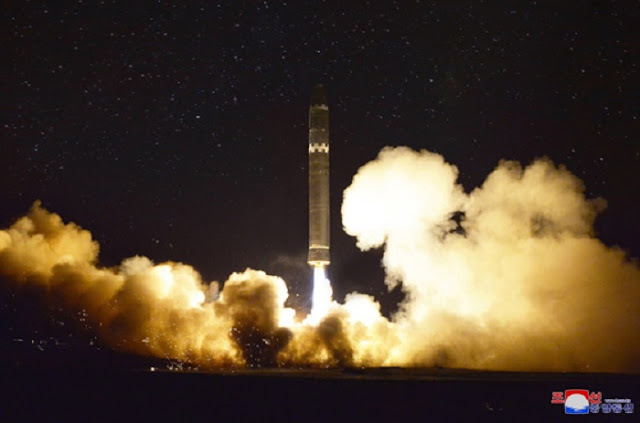 On the ballistic front, their November 2017 test of the Hwasong-15 ICBM showed that they could theoretically hit any part of the United States (and a majority of the rest of the world). While questions remain about the missile's ability to survive reentry, there is no doubt that this is a huge step forward. Its size, range, and changes to the reentry vehicle over the Hwasong-14, all point to a program that is rapidly nearing completion. At this point you may be asking what all of this has to do with the title? In October 2017, North Korea's Foreign Minister, Ri Yong Ho, said that Kim Jong Un was committed to testing a nuclear weapon in the atmosphere. And rumors of such a test have been heard prior to this statement, too. Atmospheric nuclear testing was last carried out in 1980, by China. The US, Soviet Union, and UK each ended their atmospheric testing in 1963 with the signing of the Partial Test Ban Treaty (PTBT). North Korea's Exclusive Economic Zone (EEZ) in red, South Korea's in green. Data from Marine Regions. The purpose of such a test would be, ostensibly, to prove their ability to attach a nuclear warhead to a missile and then to fire it off toward the sea and have it detonate - demonstrating they are indeed a fully capable nuclear weapons state. Any test would have to be carried out within the limits of North Korea's territorial waters, or at a maximum, its exclusive economic zone. 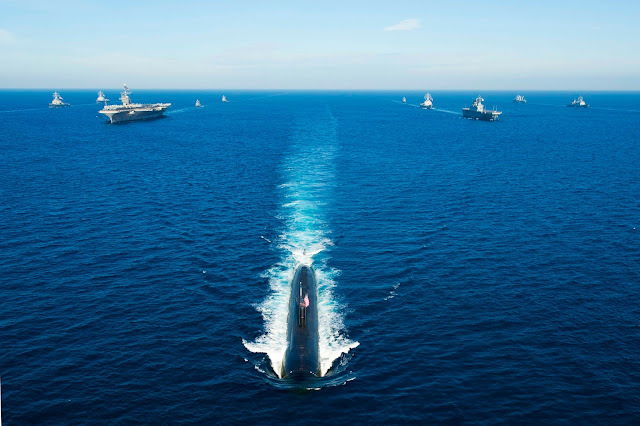 Firing a nuclear missile outside of their EEZ would trigger a major world crisis the likes of which hasn't been seen since the Korean War. 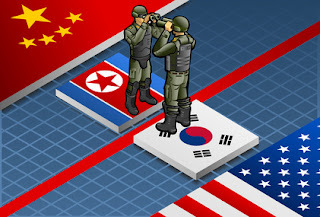 Of course such a test (regardless of whether or not it occurred within their own territory) would likely permanently alter regional relations, could easily drive China out of whatever remaining alliance with the DPRK they have, spur Japan into full-on re-militarization, and could even lead to an attack on the North by either South Korea or the US. It's also highly unlikely that the US would sit idly by and watch as North Korea mounted a nuke onto a missile and fire it. So the chances of an atmospheric test are rather low in my estimation. Beyond the geopolitical implications, the environmental impact would also undo progress toward addressing the radioactive genie that was released after the Trinity Test in 1945. Atmospheric testing releases huge amounts of radiation into the environment. A 2013 study that looked at atmospheric radiocarbon showed that 2010 levels were at their lowest since the late 1950s, with the PTBT being the seminal moment when radiocarbon rates began to sharply decline. Above ground tests (atmospheric or otherwise) also release large amounts of radioactive Iodine, Strontium, Uranium (obviously), Caesium, Xenon, and other radionuclides. The half-lives of these materials range from a few hours (as in the case of Xenon) to hundreds of years and longer. Above ground testing can throw radioactive particles as high as 50 miles into the atmosphere where they will then be carried by the winds for many miles (with minute amounts traveling the globe) until they eventually settle back down to the ground and sea where they will continue to release radiation for years to come. Local radioactive fallout can extend in a plum easily over 100 miles long, placing each regional nation at risk of receiving fallout depending on the specifics of the test and weather conditions at the time. All of these risks - the overt threats to South Korea, Japan, and the US, the dangers of spreading fallout over Chinese or Russian territory, etc. 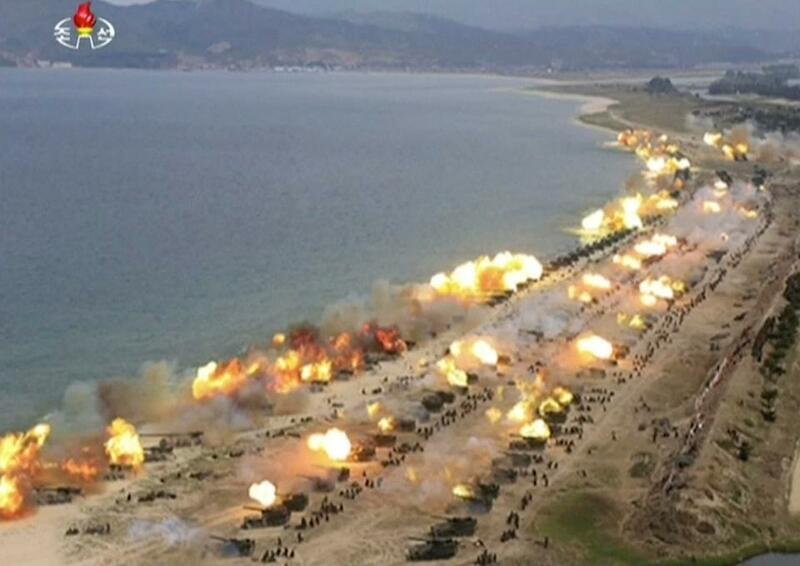 - are why I hold strong doubts that North Korea would ever conduct an above ground test. 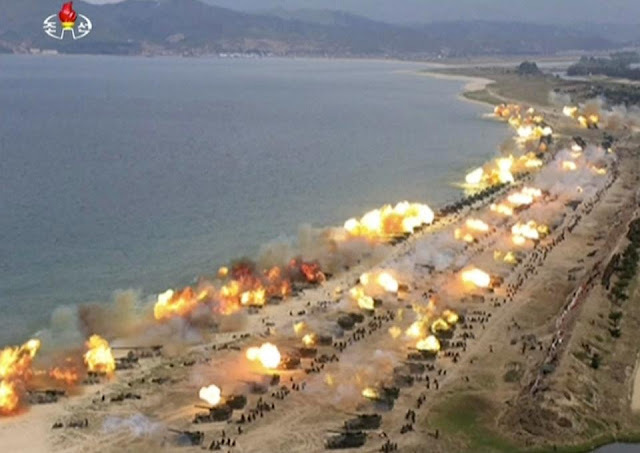 However, while thinking on the subject, I also considered what ground locations may exist that North Korea could use to conduct an old-school non-atmospheric above ground test. 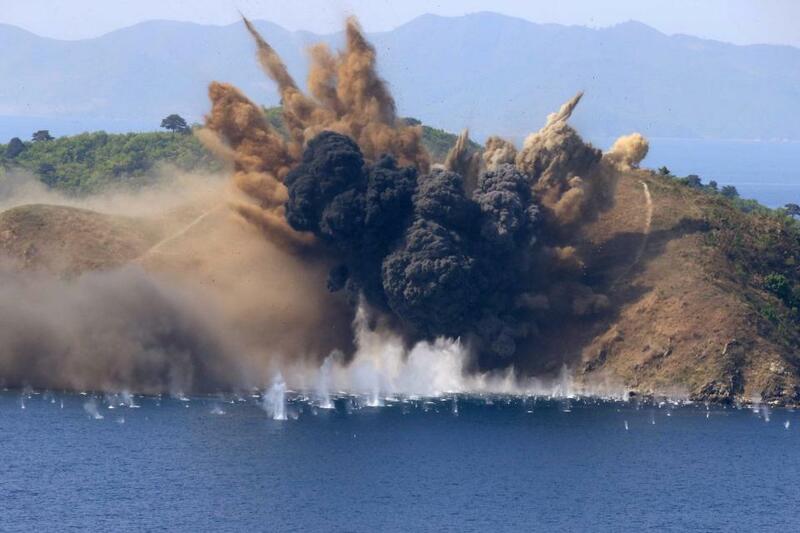 Analysts have determined that the Punggye-ri test site may have experienced tremendous damage, particularly as a result of the latest test. While activity at other tunnels around the site has been seen, continued nuclear testing greatly raises the risk of a major collapse and release of radioactive materials. So the next best thing may be an above ground test. Possible suitable locations for an above ground nuclear test. I searched for the criterion of a 12-mile diameter circle (an "exclusion zone") that didn't overlap with any populated areas or, in the case of islands, that didn't overlap another island group or cross onto the mainland, and that wasn't too close to China or Russia. I was able to locate four such places. Three of which are islands/group of islets, and one is the Punggye-ri site itself. Punggye-ri is isolated enough that there are no cities or towns within the 12-mile circle and the nearby concentration camp (with its thousands of prisoners) would partially be protected from the immediate radioactive fallout effects by the mountain itself. The other three sites are far enough away from the coast and any populated islands that the civilian population would be safe from the actual blast of a nuclear device, so long as it wasn't too large. These sites also have the added benefit of being within North Korea's internationally accepted territorial claims, which would give Pyongyang some degree of diplomatic cover. We can only wait and see if Kim Jong Un thinks it's worthwhile to set off a nuclear device in the open, be it fired from a missile into the sea, set off on an island, or even detonated in the ocean from a barge, but one thing we can be sure of is now that he has a bomb and a missile, he won't be giving them up for cheap. The amount of resources dedicated to the construction, maintenance, and expansion of the cult over its decades of existence has cost the country billions in direct and indirect costs. The funding apparatus of this system features heavily within the bureaucratic hierarchies and helps to “grease the wheels” when it comes to providing assets for military programs and large construction projects; ostensibly to enable the construction of a “strong and prosperous nation”. In a country where one man rules with an iron grip and in which no major decision can be made without him, the use of the cult (and its mix of nepotism and bribery) is essential to Kim Jong-un’s ability to preserve his power and to direct resources to the parts of the economy he wishes to improve. However, the net effect of this has led to a byzantine system of kickbacks and inefficiencies that have hampered economic growth and progress as enormous efforts and monies are redirected away from the general economy to keep the system functioning. The personality cult began soon after Kim Il-sung came to power in 1948. However, its intensity and the level of resources dedicated to it vastly expanded during Kim Jong-il’s rise to power as he elevated his father in an attempt to secure his own eventual succession as the unquestioned leader after his father’s eventual death in 1994 (after death he was then elevated to the position of Eternal President). Part of the cultural foundations of the cult that have allowed it to take root and survive for so many years, stem from Korea’s traditional imperial and Confucian past and its highly patriarchal nature. Additionally, in light of Korea’s history of reliance on and subjugation by outside forces, the development of Juche in the early history of North Korea (in practice, a mix of self-reliance and nationalist racialism) makes more sense. In such a context, the invention of a supreme leader (or Suryong) who is vested with the “will of the people” and who alone can guide and protect the nation is understandable. Since then, the cult has been embellished, refined, and expanded with each generation of Kim, as though by Divine Right. All fundamental documents and guiding principles of North Korea codify and are bound by the cult: the Constitution, the Juche Idea, and the Ten Principles for the Establishment of a Monolithic Ideology. It touches on every aspect of life: education, daily work, the economy, art, and the military. In order to enforce the cult in the minds of the people, there are approximately 10,000 individual stone and bronze monuments throughout the country , and every train station, government office and home must contain images of Kim Il-sung, Kim Jong-il, and Kim Jong-un (images of other family members, like Kim Jong-suk, can also be found). Many schools contain miniature models of Kim Il-sung’s Mangyongdae birthplace, and even the various places the leadership has visited become elevated; with ink pens used or benches sat upon turned into mini-shrines. The most obvious evidence of the enormous resources poured into the cult is easily found in the thousands of monuments, propaganda signs, and museums which cover the nation. The impact of the cult on the economy and culture is a complicated matter, not just due to the opaque nature of North Korea as a general rule, but also because so much of its effects aren’t as obvious as the many statues. Perhaps the easiest area to review is in terms of hard dollars. There are no firm estimates about the overall cost of the cult, either in direct costs such as those of constructing monuments, or in the muddier costs due to its effects on education, its general impact on culture, etc. Having said that, the estimates that have been published vary somewhat as to the cost of maintaining the cult, with lower bound figures at $40 million to $100 million annually. This doesn’t necessarily take into consideration large single expenditures such as the renovations to the Kumsusan Memorial Palace. In 1994 Kim Jong-il ordered the palace converted into Kim Il-sung’s mausoleum at a reported cost of $100 million. 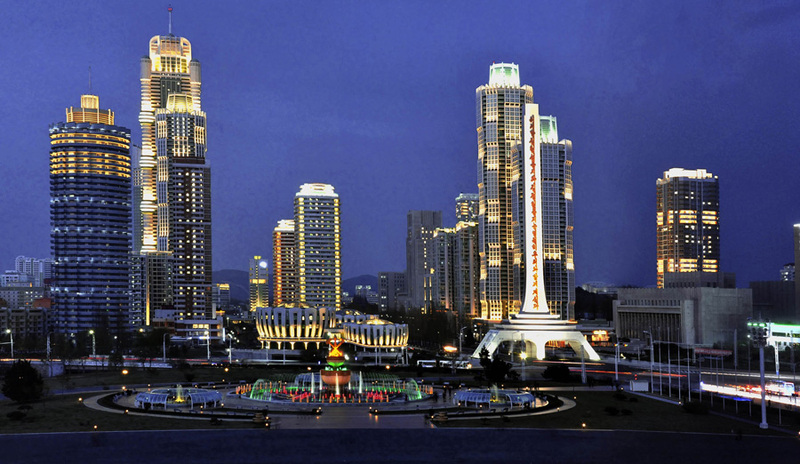 The palace underwent further changes after Kim Jong-il’s death in 2011. Upper bound estimates suggest several billion (note A) are spent each year on direct glorification of the Kims and indirectly via "cultural" and other spending which serve as a conduit to spread government propaganda. Going further back in time, many of the costs of the cult during the Kim Il-sung-era are generally lacking, making acquiring firm estimates for that period even more difficult. What is known is that projects such as the original 1972 golden statue of Kim Il-sung at the Mansudae (Mansu Hill) Grand Monument, with a value estimated at $851 million, so appalled visiting Chinese dignitaries that it was later replaced with a bronze version , and that such large-scale projects have been blamed for part of North Korea’s economic decline in the 1980s,  with a famine following in the 1990s. After Kim Jong-un’s rise to power, in part to help secure his rule due to his young age and perceived lack of experience, the government took rapid steps to build up a cult around him. At the same time, the state worked to escalate the veneration of Kim Jong-il - during which the government installed him as the nation’s second eternal leader: the Eternal General Secretary of the Korean Worker’s Party. The roughly 3,000 “Towers of Eternal Life” which were erected after Kim Il-sung’s death have been modified to include references to the eternal life of Kim Jong-il. And, based on a review of satellite imagery, included in the escalation of the Kim Jong-il cult was the construction of twenty-seven bronze statues in major cities to be placed alongside those of Kim Il-sung (some of which were replaced with newer versions). 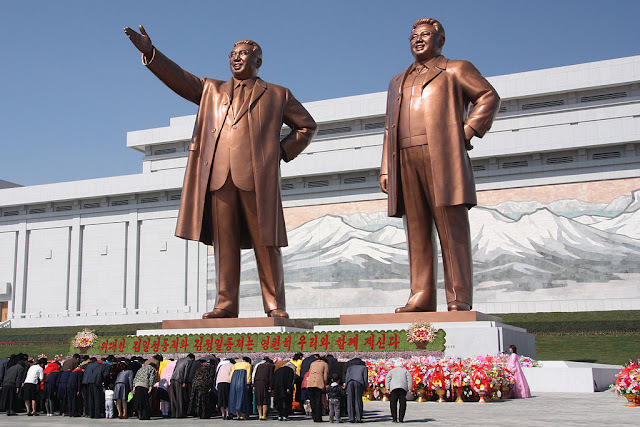 These statues range in size from 5.3 meters in height to the large 23-meter tall Mansudae statues. Additionally, approximately 150 five-meter high murals of Kim Jong-il were installed next to existing murals of Kim Il-sung in county seats and other towns. Figure 6: Jangdae Hill, Pyongyang. Left: A mural of Kim Il-sung in 2010. Right: Twin murals of Kim Il-sung and Kim Jong-il (installed in February 2011). Image credits: (Left) John Pavelka/Flickr; (Right) Wikimedia Commons. Not to be out done, some monumental works glorifying Kim Jong-un are large enough to be seen from space, like a half-kilometer long sign in Ryanggang Province which reads, “Long Live General Kim Jong-un, the Shining Sun of [North Korea]!” Additionally, plans are now underway to place stand-alone “mosaic murals” of Kim Jong-un in each provincial capital. Funding of the cult comes not only from government sources, but also from the people themselves in the form of “loyalty payments” exacted from each citizen and business. "Most impressive were the thirty-thousand to fifty thousand children who had trained for many months to sit in the risers behind the stage, holding up colored squares like a living mural to create enormous, ever-changing scenes and slogans glorifying the regime. Only much later did I realize how abusive it was for these children to preform for hours and hours without even a small break to eat or use the bathroom." It’s important to look at the overall costs of non-penal forced labor as well (as those in the country's vast prison camp system are generally thought unworthy to participate in the glorification of the Kims). According to Open North Korea, a Seoul-based NGO, an estimated 400,000 people form a class of laborers called dolgyeokdae. These workers receive little pay and are required to work on major construction and prestige projects that the leadership can show to the world. Apart from general construction, work on monuments is part of their duties. All of this results in the leadership’s continued ability to boast about building a strong and prosperous nation. A feat that, according to the cult, can now only be done under the “wise leadership” of Kim Jong-un. The value of the labor is estimated to be $975 million annually. Less easily accounted for are the indirect costs to the nation’s ability to innovate and engage with international partners. From grade school to university, much of a student’s academic career is spent learning about the deeds of the leadership, so much so, that even elite students may struggle with relatively simple scholastic tasks. Yeonmi Park speaks to the ordinary education of children, too: "In the morning, after we finished cleaning the streets or polishing the monuments, we were marched off to class." And, "In the classroom every subject we learned...was delivered with a dose of propaganda... This worship of the Kims was reinforced in documentaries, movies, and shows broadcast by the single, state-run television station." Later on she recounts, "As soon as you are in school you are drilled in the 10 Principles of the regime...You learn the principle of juche...and you are taught to hate the enemies of the state with a burning passion." She continues, "In North Korea, even arithmetic is a propaganda tool ...[and] any mention of the Kims had to be preceded by a title or tender description to show our infinite love and respect." The role of the public education system in instilling the tenants of the cult in the people can’t be overestimated. One of the first phrases children learn to speak is “thank you, Father Kim Il-sung”. Similar to Christians thanking God before a meal, all North Koreans are taught that their food, housing, education, leisure activities, etc. are given to them by the grace and love of the leadership. This isn’t an abstract notion of gratitude either, but rather it is giving thanks for what is seen as the benevolence of the leadership, literally to each person individually, and without which they would go hungry. North Korean society is divided into three main classes under the Songbun system. This system is how the government determines who gets what. What kind of careers and educational opportunities will be available, who can marry whom, and more. The top class of people are those who are seen as the most loyal while those at the bottom are seen as “hostile”. Political crimes and crimes of thought (such as questioning the regime) are considered to be some of the most serious offenses and can result in the “criminal” and their family being sent to a prison camp. In this way, one’s place in the very fabric of society is tied to one’s obedience and acceptance of the leadership and Party. 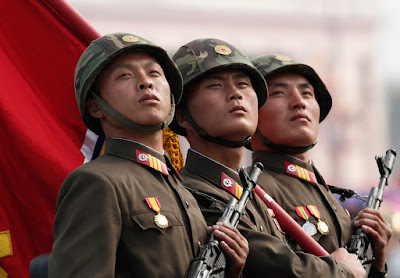 Recurring rituals, like the laying of flowers at statues, or the regular “self-criticism” sessions during which people are supposed to acknowledge their faults and the various ways they let the Great Leader down (even for the most minor offenses), have enabled the indoctrination of millions of North Koreans for generations into the Cult of Kim. Nearly every holiday is concerned with the Kims. The “Day of the Sun” is Kim Il-sung’s birthday, for example. Through these events people can prove their loyalty and maintain their positions, or be raised up (or made low). These times also serve as opportunities for the government to prove that the Leader is indeed the great benefactor of the people. Gifts proportionate to each citizen’s Songbun class are distributed during major holidays. Holidays are also times when the government tends to announce new large construction projects or the success of military projects, thereby validating (through exaggerated propaganda) what they have been telling the people year-round. For those things that can be seen and measured, so long as the government continues to demand absolute fealty, millions will continue to be spent on stone edifices that dot the landscape and in countless other ways to remind the people that ‘without him, there is no us.’  The people’s heart-felt dedication to the cult may have diminished since the days of Kim Il-sung, but it remains, nonetheless, an integral part of the whole society. This entrenched reality makes it highly unlikely that there will be any fundamental changes in the near future as any such changes would alter the structure of the cult and weaken the Kim's position. Additionally, outside attempts to diminish the cult (and thus its hold over the nation) through sanctions or other hard power methods are unlikely to have much effect, as the country itself relies on upholding the cult. Those in power remain in power through their loyalty and by finding ways to help finance the desires of Kim Jong-un. Likewise, those wishing to rise in influence can only achieve their wishes by contributing to the Cult of Kim. The best example of this was the rise of Kim Jong-il himself, who, prior to the years of work he engaged in the idolization of Kim Il-sung, was not originally seen to be a probable successor to his father. 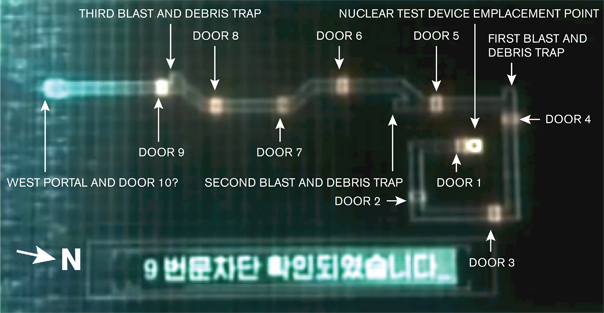 Figure 10: Image from KCTV April 2017 broadcast showing the opening of Ryomyong Street and the Tower of Eternal Life after renovations. A. 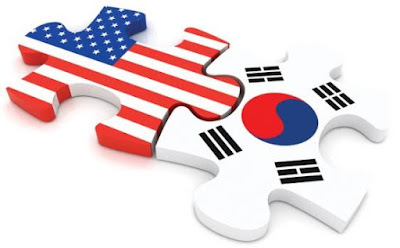 A 2007 study by the Korean Institute for International Economic Policy reported that state expenditures on the cult grew from 19.5% of the nation's budget in 1990, to 38.5% by 2004. Outside of the military, which is a separate economic and budgetary entity within North Korea, Professor Rüdiger Frank suggests that the national budget can be viewed as synonymous with the economy. If this is the case, 38.5% of an approx. $23 billion GDP (2004) equals $8.8 billion. 1. Jin-sung, Jang, Dear Leader: Poet, Spy, Escapee – A Look Inside North Korea. New York, NY. 37INK/Atria, 2014. Page 132. 2. Kim Jong-un, The Cause of the Great Party of Comrades Kim Il Sung and Kim Jong Il is Ever Victorious, Foreign Languages Publishing House, October 4, 2015. 3. The number of monuments is derived from a four-year long mapping project by the author. 4. Oberdorfer, Don Carlin, Robert, The Two Koreas A Contemporary History, New York, NY, Basic Books, 2013. Page 16. 7. Becker, Jasper, Rogue Regime: Kim Jong Il and the Looming Threat of North Korea, New York, NY, Oxford University Press, 2005. Page 150. 9. The figure is derived using a base salary of $100/month. Each participant trains for at least 90 minutes a day, six days a week from January to September. That gives 234 days of training (six-day weeks), multiplied by 90 minutes equals 351 hours per person. 351 hours equals 2.19 months’ worth of 40-hour work weeks, or $219 in would-be salary per person. Multiplied by 100,000 participants and you reach $21,900,000. 12. “Without you, there would be no us!” is a verse from the North Korean song “No Motherland Without You” about Kim Jong-il.